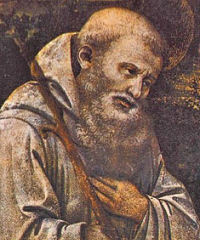 O God, who through Saint Romuald renewed the manner of life of hermits in your Church, grant that, denying ourselves and following Christ, we may merit to reach the heavenly realms on high. Through our Lord Jesus Christ, your Son, who lives and reigns with you in the unity of the Holy Spirit, one God, for ever and ever. According to the 1962 Missal of St. John XXIII the Extraordinary Form of the Roman Rite, today is the feast of St. Juliana of Falconieri who was born in Florence in 1270. She was about fifteen when, at the end of 1284, St. Philip Benizi, General of the Servite Order, received her among the Mantellatae, the female branch of the Order. She had a great devotion to the Holy Eucharist and practiced to a rare degree the Servite devotion to the Sorrows of our Lady. She died in Florence in 1341.